SIAE is the Italian Society of Authors and Publishers and, as such, it is managed by the Governing Bodies appointed and elected by its members. The internal organization is coordinated by the Director General, with the task of directing, coordinating and organizing the executive and non-executive staff of the Society. Besides its Headquarters, SIAE also has 10 regional offices, 28 local offices and 436 agents located all over the national territory. The tasks and composition of SIAE’s Governing Bodies are regulated by the Society’s Statute. The Governing Bodies of the Society are: the Assembly, the Supervisory Board, the Management Board and the Board of Auditors. The Chairman of SIAE’s Management Board is the legal representative of the Society; the Chairman convenes and presides the Assembly and the Management Board. The Management Board dictates the Society’s governance and controls its carrying out by the Director General; it decides the policies to be adopted for pursuing the interests and the institutional goals of the Society; as well, it approves the distribution criteria of the royalties and the size of fees for the use of the works included in each section. The Chairman of the Supervisory Body is appointed among the Directors elected by the Assembly; he convenes and presides the Supervisory Board itself. The Supervisory Board decides upon the industrial and strategic plans of the Society drawn up by the Management Board, it decides on any possible modfications of the Statute and approves the budget and the managemet report submitted by the Management Board. Within the Supervisory Board, five advisory Commissions are appointed: the Music Commission, the Opera Commission, the OLAF Commission, the Cinema Commission and the DOR Commission. They give their mandatory but not binding opinion to the Management Board on the criteria for the distribution of royalties of and on the fees for the use of the repertoires assigned to them. The Assembly is convened by the Management Board for the election of the Supervisory Board, whenever the Management Board thinks it necessary and whenever it is asked by at least one twentieth of the members having regularly paid their membership fee and representing at least one twentieth of the royalties distributed by the Society during the foregoing accounting period. The Board of Auditors is responsible for the financial control of the Society, according to what provided by the Civil Code (Art. 2403 bis and the following). The Society has adopted an Organization and Management Model suitable for preventing crimes, according to the Legislative Decree nr. 231 of 2001. To such an end, SIAE has established a Control Body provided with autonomous implementation and control powers over the carrying out of what provided by the Model. 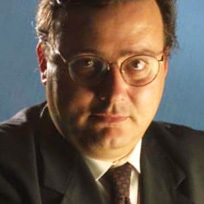 Born in Rome on 13 March 1962, Gaetano Blandini graduated in Political Science at the University in Rome. In 1982 he started his career in the Public Administration, holding different different positions, among which Auditor by the Regio Theatre inTurin and the Foundation Emilia Romagna Teatro. In 2002 he was appointed second-tier Executive of the Ministry for the Cultural Heritage and Activities and he was given the office of Executive Inspector. He was then appointed a member of the Board of Directors of Cinecittà Holding SpA. He collaborated at the drafting of the statute of the Italian Theatre Body ETI, the reform of the opera symphonic foundations, the new law for cinema and the decrees for the FUS (Unique Show Business Fund). In 2004 he was appointed General Manager for Cinema by the Ministry of Cultural Heritage and Activities and has been many times confirmed in this position.